Special thanks to Monika Drozynska, Justyna Koeke, Cecylia Malik and Anna Barkiel. Red Weight is a one hour performance in public space. 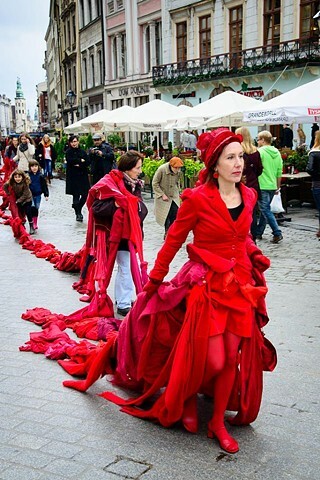 Dressed formally with a skirt made from 600 pieces of used red clothing I pulled the gown with its long train through the streets of central Krakow - Grodzka Street through the Main Square to Szewska Street to Bunkier Stzuki Gallery over the duration of one hour. Dressed and groomed impeccably in red, moving slowly in a dignified manner, I pulled the very heavy burden through the city, sometimes struggling with bunched up sections and wrangling with the enormous weight of the tangled pieces of clothing. I often stopped on the way to answer questions of passers by and to discuss the process with interested members of the public. The audience and participants engaged in a humorous way as the action is clearly doomed to failure. However, it is also beautiful because of the strong aesthetic spectacle of the myriad red textures and qualities of fabric juxtaposed together. Audience members and random passers by joined in to help pull the garment along, making a long human chain connected by the train of red clothing. The central concept of the performance is to show the tension between the enormous difficulty of the task and the dignified attempt to succeed. This image becomes a metaphor for the weight of past experience, beautiful and cumbersome, elaborate and oppressive. We carry the weight of all our memories, dreams and accumulated possessions through life, but we do not have to do it alone. We are helped my many others along the way. The use of the colour red represents life, passion and the body.